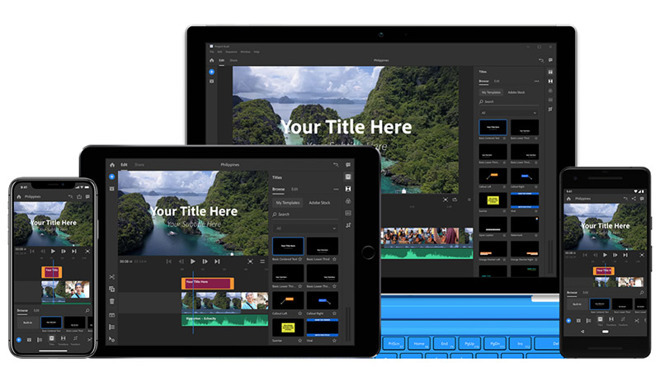 In development for years, Adobe offered a sneak preview of Project Rush to VidCon attendees on Tuesday, showcasing the all-in-one tool that delivers professional results across multiple hardware platforms, both at home and on the go. About to enter beta testing, Project Rush is the culmination of Adobe's efforts to build an app capable of performing complex video production tasks on nearly any device. When it launches later this year, the software will allow creators to cut clips, add filters, overlay motion graphics, optimize audio and publish to the web within a single app environment that spans Mac, iOS and Windows. Adobe showed off Project Rush in a presentation last week, highlighting the app's easy to use interface and powerful behind-the-scenes features. 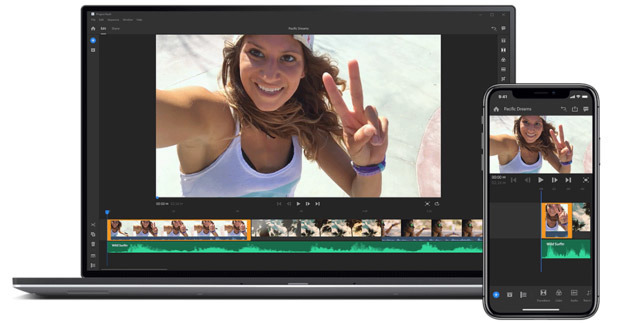 The user interface, which shares design elements across platforms, is similar to Apple's own iMovie, a consumer level cross-platform video editor available to iOS and Mac users. Clips can shot in-app or ingested from local storage, dragged and dropped into place, trimmed and arranged on a color-coded timeline. All changes are automatically synced to the cloud and pushed down to other versions of the app, whether it be mobile or desktop. Of note to professionals, Rush creates file proxies for large, high-resolution files when editing on mobile, then applies project modifications to the original full-size files when syncing to a desktop version of the app. For example, a project involving 4K video clips can be offloaded and edited on iPhone at a lower resolution, with edits transferred back and applied to origin 4K clips on Mac. Alternatively, users can publish their edits directly from mobile using the lower resolution proxy files. 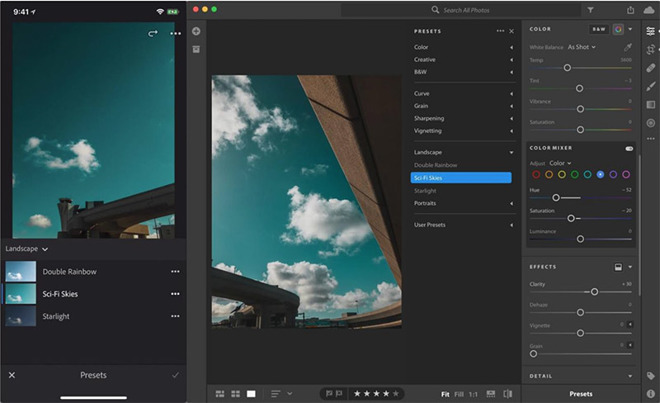 The app integrates color correction functions like filters and advanced color editing powered by technology developed for Premiere Pro, Adobe's professional level video editing software. Perhaps more impressive is the vast array of in-app Motion Graphics templates, or animated text packages that are used to create titles. During the demonstration, Motion Graphics templates developed by Premiere Pro and After Effects artists were applied to a sample video. Unlike presets offered in competing software, titles in Rush can be resized and repositioned, while users can further customize text with different fonts, colors and more. Adobe says additional Motion Graphics templates will be made available through Adobe Stock integration. Rush's audio engine is similarly powered by technology borrowed from Adobe's professional level products, in this case Audition and Sensei machine learning. The app is capable of automatically detecting audio in a video clip, allowing users to break out a dedicated channel and quickly duck sound with a click or tap. Special tools provide further functions to improve sound quality and reduce background noise. As for publishing, Rush includes built-in sharing presets for a variety of platforms. The demo was focused on YouTube, though Adobe promises support for other venues including Facebook, Instagram and more. Those interested in testing early versions of Rush can apply for a spot in Adobe's beta program. Also at VidCon, Adobe announced updates to Lightroom CC, which receives new synchronization features for presets and profiles. Specifically, users can sync custom presets and profiles, as well as third-party presets and profiles, between Lightroom CC for Mac, iOS, Windows, Android, ChromeOS and the web. In addition, Mac versions of the photo editing software now support batch copy and paste for transferring settings from one image to multiple images, while enhanced album sharing options provide more control over what is made available to collaborators. Mobile versions of the app now support preset creation, the Healing Brush tool and, for iOS only, a chromatic aberration removal tool. Finally, Adobe XD gets Fixed Elements, Overlays, improved crop and place image fills, improved collaboration features, a new math calculations feature, design feature enhancements and more.